Health: The Basics plus MyHealthLab with eText -- Access Card Package 10 Edition ALERT: Before you purchase, check with your instructor or review your course syllabus to ensure that you select the correct ISBN. Several versions of Pearson's MyLab & Mastering products exist for each title, including customized versions for individual schools, and registrations are not transferable. In addition, you may need a CourseID, provided by your instructor, to register for and use Pearson's MyLab & Mastering products. Packages Access codes for Pearson's MyLab & Mastering products may not be included when purchasing or renting from companies other than Pearson; check with the seller before completing your purchase. Used or rental books If you rent or purchase a used book with an access code, the access code may have been redeemed previously and you may have to purchase a new access code. Access codes Access codes that are purchased from sellers other than Pearson carry a higher risk of being either the wrong ISBN or a previously redeemed code. Check with the seller prior to purchase. -- Health starts here! 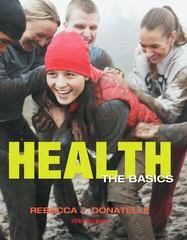 With an emphasis on media, the new Health: The Basics, Tenth Edition features robust relatable content, bringing health topics to life and keeping you hooked on learning and living well. Now enhanced with an even more comprehensive package of easy-to-use media and supplements, this edition makes teaching and learning personal health extra dynamic. The Tenth Edition includes new ABC News videos, more online worksheets, new course management and eText options, Tweet Your Health, new student “behavior change video log (vlog)” videos, countless new teacher supplements, and more. These resources bring personal health to life in any form–in the classroom, online, or on the iPad. These tools all motivate students to be more interested in the book content and invest in their health.